Photo taken by: Randyblu... thanks so much! Nice long exposure of the falls. I'd love to see that photo just a little bigger. Well worth hanging up I'd say. Beautiful photo. It should be on a post card. absolutely gorgeous picture! I would print that puppy and hang it for all to see! i love those long exposures of water falls, it makes them look heavenly or something :) happy WW! Gorgeous! There is nothing so spectacular around me (and I guess I haven't traveled to where there are any falls in a while). I will just have to enjoy your photo. Thanks for visiting me earlier. Have a happy WW! Great picture, what a lovely place. That's gorgeous! The slow shutter makes it look like sugar sifting over the rocks. Wonderful shot! Waterfalls are among my favorite subjects for photographs. This is a very nice one. 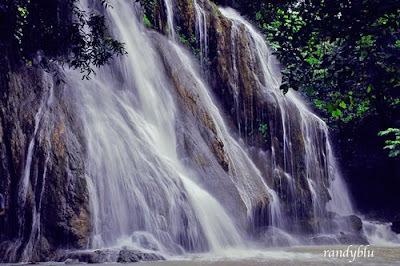 A waterfall is one of natures most wonderful creations. It is like the ocean it makes you feel one with nature. OMG - I would love to see that! What a beautiful pic! SO sorry that my site was giving you problems - someone else had a problem when typing in the URL - did you try it with the "http://" in front of www? Anyhoo - hope it doesn't give you any problems next time. And hope you had a great WW! I love this photo. So beautiful! Great picture, I can almost hear the water. Would love to just lay by the water and watch the falls.